Exo-CBX (Hangul: 엑소-첸백시 Exo-Chen-Baek-Xi; stylized as EXO-CBX) is the first official sub-unit of South Korean-Chinese boy group Exo. Formed by SM Entertainment in 2016, the group is composed of three Exo members: Chen, Baekhyun, and Xiumin. Their debut extended play Hey Mama! was released on October 31, 2016. 1.1 2016: Formation, debut and Hey Mama! On July 29, 2016, Chen, Baekhyun and Xiumin appeared in a video titled "Reservoir Idols" during Exo's concert tour Exo Planet 3 – The Exo'rdium. They then released an original soundtrack titled "For You" for the SBS television drama series Moon Lovers: Scarlet Heart Ryeo on August 23, 2016. As a result, it was speculated that they would form Exo's first sub-unit. This was confirmed by SM Entertainment on October 5. On October 23, they performed "For You" for the first time as a unit at the 2016 Busan One Asia Festival. On October 24, the unit's name was announced to be Exo-CBX (shortened from ChenBaekXi), after the first letter of the members' stage names. On October 31, Exo-CBX released their debut extended play Hey Mama!, which contains five tracks with a variety of genres including electronic dance, R&B ballad and retro pop, along with the music video for the title track. The group made their debut performance on M Countdown on November 3. On November 6, the "Reservoir Idols" video was officially released as a music video for "The One", one of the tracks from the album. Hey Mama! topped the Billboard World Albums chart and South Korean's Gaon album chart. 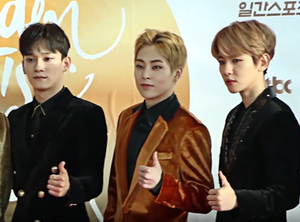 Later in November, Exo-CBX recorded a remake of the original soundtrack "Crush U" for the game Blade & Soul. They performed the song on November 18 at the N-Pop Showcase concert, part of the 2016 Blade & Soul world championship tournament. On December 25, "Crush U" music video was released. In January 2018, via an online program on LINE, they announced that they have prepared for their first Japan arena tour called "Magical Circus" in May and June. The tour had eight shows with four cities in Japan, including: Yokohama, Fukuoka, Nagoya and Osaka. On April, the group released their second Korean mini album Blooming Days. CBX's first Japanese studio album, Magic, was released on May 9. In February, 2019, it was announced that the group will have Special Edition concerts of their Japanese tour "Magical Circus" in April. Notes: Billboard Korea K-Pop Hot 100 was introduced on May 29, 2017. Alibaba music chart discontinued in November, 2017. Note: Alibaba music chart discontinued in November, 2017. "—" denotes that the release didn't chart in that region. The Gaon Chart Music Awards is a major music awards show that is held annually in South Korea by the national music record chart Gaon Chart. Exo-CBX have received two nominations. Established in 1986, Golden Disc Awards is a significant annual music awards show in South Korea. Exo-CBX have received four nominations. Established online in 2005 and with an awards show in 2009, Melon Music Awards is a significant annual music awards show that honors artists for their chart performance on the largest music streaming service in South Korea, Melon. Exo-CBX have received one nomination. Established in 1999 and presented by Mnet, the Mnet Asian Music Awards is a significant annual music awards show held in various Asian countries. Exo-CBX have received one award from four nominations. Established in 2017, the Soribada Best K-Music Awards is an annual music awards show presented by Soribada, a music streaming service in South Korea. Exo-CBX have received three nominations. The Show is a weekly music program aired in South Korea by SBS MTV. Exo-CBX have received one award. ^ In April 2018, Gaon Chart introduced music recording certifications for albums, downloads and streamings. ^ Dam-young, Hong (April 11, 2018). "[Album review] EXO-CBX's album inspired by days of the week is top-notch". The Korea Herald. Retrieved June 23, 2018. ^ "첸·백현·시우민, 엑소 첫 유닛 출격..10월 말 출격" (in Korean). entertain.naver.com. October 5, 2016. Retrieved November 27, 2016. ^ "[BOF]'엑소 유닛' 첸백시 첫 공식무대, 2만 5천팬 홀렸다" (in Korean). entertain.naver.com. Retrieved October 24, 2016. ^ a b SMTOWN_EN. "[Vyrl] SMTOWN_EN : #EXO's first unit #EXO-CBX 1st mini album 'Hey Mama!' drops Oct 31, 0A". Retrieved October 24, 2016. ^ SMTOWN_EN. "[Vyrl] SMTOWN_EN : #EXO-CBX's 1st mini album '#HeyMama!' includes 5 tracks with a variety". Retrieved October 28, 2016. ^ "#EXO-CBX release MV for "Hey Mama!"". Allkpop. October 31, 2016. ^ "엑소 첫 유닛 '첸백시', 11월 3일 엠카로 첫방". 인사이트 (in Korean). Retrieved October 24, 2016. ^ "EXO Splinter Group EXO-CBX Hits No. 1 on World Albums With Debut EP 'Hey Mama'". Billboard. Retrieved April 17, 2018. ^ Kim Joo-ae (November 18, 2016). "'N-POP' 엑소-첸백시X레드벨벳, '블소' 켜게 만드는 마성의 목소리". Xsports News (in Korean). Retrieved November 18, 2016. ^ "[영상] 엑소 첸백시의 '크러쉬 유' 뮤직비디오 공개". Retrieved 2016-12-26. ^ a b "EXO-CBX 初の日本での東名阪福アリーナツアーが開催決定！". EXO(エクソ) OFFICIAL WEBSITE (in Japanese). Retrieved 2019-03-20. ^ Herald, The Korea (2018-05-13). "EXO-CBX kicks off first Japanese arena tour in Yokohama". www.koreaherald.com. Retrieved 2019-03-20. ^ "엑소-첸백시(EXO-CBX), 4월 10일 두 번째 미니앨범 '블루밍 데이즈'로 컴백". chicnews.mk.co.kr (in Korean). Retrieved 2018-04-06. ^ "2018.05.09 Exo-CBX JAPAN 1st FULL ALBUM『MAGIC』ジャケット写真＆商品詳細公開‼‼" (in Japanese). Retrieved 2018-04-11. ^ Herald, The Korea (2018-04-25). "EXO-CBX to drop first full-length album in Japan in May". www.koreaherald.com. Retrieved 2019-03-20. ^ "EXO-CBX OFFICIAL WEBSITE". exo-jp.net (in Japanese). Retrieved 2019-03-20. ^ "2019년 EXO-L 투어 (1,2) 가신청 - EXO-CBX 일본 사이타마 & 고베 공연". exo-cbx.smtown.com. March 8, 2019. Retrieved 2019-03-20. "Billboard Japan Top Albums Sales - May 21". "Billboard Japan Top Albums Sales - May 28". "Billboard Japan Top Albums Sales - June 04". "Billboard Japan Top Albums Sales - June 18". "週間　デジタルアルバムランキング (2018年05月21日付)". Oricon (in Japanese). May 16, 2018. Archived from the original on May 16, 2018. "Hey Mama!". October 30 – November 5, 2016. "Blooming Days". April 8–14, 2018. "Blooming Days". April 13, 2018. "Hey Mama!". November 19, 2016. "Blooming Days". April 21, 2018. "Hey Mama!". November 14, 2016. "Blooming Days". April 23, 2018. "Gaon Album Chart - 2016 Year End Chart". Gaon Chart. January 24, 2018. Retrieved January 24, 2018. "Gaon Album Chart - December 2017". Gaon. February 18, 2018. Retrieved February 18, 2018. "Gaon Album Chart - April 2018". Retrieved May 10, 2018. "2018년 08월 Album Chart". Gaon (in Korean). September 5, 2018. ^ "2016 Oricon Chart – December Week 1". Oricon. Retrieved December 15, 2016. ^ "EXO Splinter Group EXO-CBX Hits No. 1 on World Albums With Debut EP 'Hey Mama'". Billboard. Retrieved November 11, 2016. "2018 Album Chart". Gaon Album Chart (in Korean). Retrieved January 11, 2019. ^ "Blooming Days on Xiami Music". Xiami. July 28, 2018. Retrieved August 28, 2018. Oricon Monthly CD Album Ranking of April 2018. Oricon. May 9, 2018. Archived from the original on May 9, 2018. ^ "Gaon Certification - Album". Gaon Chart. Retrieved June 7, 2018. ^ "2017 Oricon Weekly Chart". theqoo.net (in Korean). June 20, 2017. Retrieved June 27, 2017. "Blooming Day". April 8–14, 2018. "Hey Mama!". October 30 – November 6, 2016. "Horololo". Billboard Japan. May 21, 2018. Retrieved May 17, 2018. ^ "World Digital Songs". Billboard. (Subscription required (help)). "Gaon Download Chart - Week 45, 2016". gaonchart.co.kr. Retrieved 2016-11-11. "Gaon Download Chart - Week 46, 2016". gaonchart.co.kr. Retrieved 2016-11-17. "Gaon Download Chart - Week 47, 2016". gaonchart.co.kr. Retrieved 2016-11-24. "Gaon Download Chart - Week 48, 2016". gaonchart.co.kr. Retrieved 2016-12-02. "Gaon Download Chart - Week 49, 2016". gaonchart.co.kr. Retrieved 2016-12-08. "Crush U". December 4–11, 2016. ^ "2016 Gaon Download Chart - Week 50". gaonchart.co.kr. "The One, Cherish, Juliet, Rhythm After Summer". October 30 – November 5, 2016. "Playdate, Sweet Dreams!, Monday Blues, Vroom Vroom, Thursday, Lazy". April 8–14, 2018. "The One, Rhythm After Summer, Juliet & Cherish". October 30 – November 6, 2016. "Diamond Crystal, Miss You, KING and Queen, Girl Problems, Tornado Spiral & Hey Mama!". May 21–28, 2017. ^ a b "Gaon Download Chart - Week 45, 2016". gaonchart.co.kr. Retrieved 2016-11-11. "QQ Music: Someone Like You". QQ Music. March 24, 2018. Retrieved May 14, 2018. "Kugou Music: Someone Like You". Kugou Music. March 24, 2018. Retrieved May 14, 2018. "Kuwo Music: Someone Like You". Kuwo Music. March 24, 2018. Retrieved May 14, 2018. ^ a b "EXO-CBX "Magical Circus" Tour 2018". October 23, 2018. "EXO-CBX "Magical Circus" Tour 2018". October 23, 2018. Retrieved 2019-01-05. ^ "8th Gaon Music Chart". Retrieved 2019-01-05. ^ "소개 | 골든디스크". isplus.live.joins.com (in Korean). Retrieved 2018-08-06. ^ "The 33rd Golden Disc Nominees". Retrieved December 8, 2018. ^ "Melon". www.melon.com (in Korean). Retrieved 2018-08-06. ^ Herald, The Korea (2018-04-17). "Kakao's Melon app dominates Korea's music streaming service market". Retrieved 2018-08-06. ^ "Melon Music Awards 2017: Best Artist Of The Year goes to EXO; Complete winners list". International Business Times. December 5, 2017. Retrieved 2019-01-05. ^ "This Three-Country, Four-Night Asian Music Awards Show Is A K-Pop Promotion Machine". NPR.org. Retrieved 2018-08-06. ^ "Here Are The Winners of '2017 MAMA' In Japan". Retrieved 2019-01-05. ^ Lee, Hoyeon (November 1, 2018). "방탄소년단부터 워너원…'2018 MAMA', 투표 시작". Hankook Ilbo (in Korean). Retrieved November 5, 2018. ^ "[스페셜이벤트] 소리바다 제1회 뮤직 어워드 사전투표". Soribada (in Korean). Retrieved 2018-08-06. ^ "[2018소리바다어워즈] 방탄소년단 대상 포함 3관왕…트와이스 음원대상 2연패(종합)". News1. August 31, 2018. Retrieved 2019-01-05. ^ "EXO-CBX just bagged their first music show win for 'Hey Mama' on SBS 'The Show'". Retrieved June 23, 2018. Wikimedia Commons has media related to Exo-CBX.